As frenetic as Fancy Food can be, it is always a pleasure. Every year the bar is raised for innovation, creativity and fun. The show is a joy to attend, especially to get a taste of the good life- the West Coast in the winter. Recently we did a strategy project to understand what a restaurant could learn from home hosts, i.e. those “super hosts” who pull out all the stops to entertain their guests. These days, not only are guests asking for IPA’s, but at some parties you may even overhear someone whisper, “shaken, not stirred, darling”. 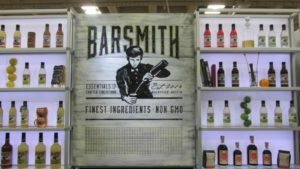 BarSmith (of Nashville and Austin) has you covered. Crafted by expert bartenders, BarSmith’s brines, syrups and mixers make for the perfect dirty martini, old fashioned, margarita or bloody to make you look like a pro. 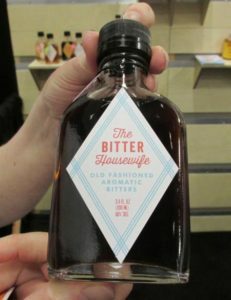 On a similar but more irreverent note, Improper Goods offers a few home “remedies” like their signature The Bitter Housewife Old Fashioned Aromatic Bitters. With flavors of walnuts, cherries, ginger, baking spices, and just enough bitterness to keep things interesting, they think of their bitters as the spice rack of cocktail making. 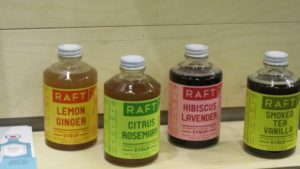 Their RAFT Botanical Syrups take a page from long lost pharmacy soda fountains with beautiful flavors like smoked tea vanilla, hibiscus lavender and citrus rosemary. Would that be Bond-James Bond? 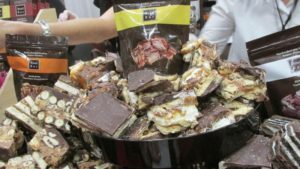 We witnessed some absolutely dangerous Bond Bars at the show- from Caramel Smores to Peanut Butter to Caramel Pretzel…no doubt this photo would break the “heart” record on Instagram for a downright sinful display of decadence. The sweets category started following snacking behavior a while ago, making it easier to get your fix at work or on the go with resealable, portable bags. In our multi-tasked, tech-addicted world, there’s a need and time for adult play -which is quite different than the “looking out the window while savoring a bonbon” moment. Here, there’s more action and texture. It’s a visceral, physical and literal “break” in the day to press pause and play. 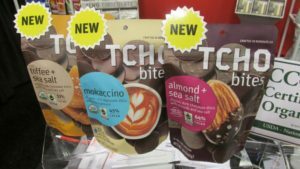 Check out new TCHO bites here for another delicious snack break. We noticed the trend of sweet going savory (cookies with herbs, for example) and savory going sweet (seen here, a new Sweet Lemon cracker). The chef at 34 Degrees had an interesting take on this, layering m int leaf, vanilla and instant espresso on their cracker for pure, concentrated and elegant flavors- one of the nicest things we tasted at the show. What’s old is new again. 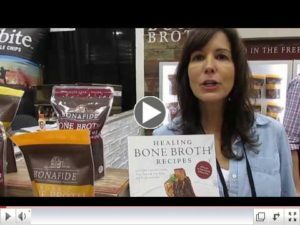 Stock has been renamed and repackaged as bone broth. We were curious about this (in our free time we love to make & freeze stocks in the winter) so we learned that bone broth is similar to stock in principle, but the difference in the details. Some companies are using the best quality ingredients, simmered longer to give a purity and depth of flavor. Forbes says the market is developing for a few reasons….first, it offers strong functional benefits (high concentrations of collagen, protein) which are apparently good for joints, etc. ), second, often there’s often a c hef connection (Brodo bone broth kiosk window started by the owner of Hearth, NYC) and finally, there’s the appeal for using sustainable ingredients (the whole animal, from snout-to-tail). To learn more about a super high-quality broth we found, click here for our chat with Bonafide Provisions . The past couple years traveling in Dublin I saw this brand in my favorite food shop, the fabulous Fallon and Byrne. Curious, I snapped a few pictures, saving them for a rainy day to research. So imagine my delight to meet the founder of Rude Health in San Francisco! When I first saw this package, I knew the brand had a wonderful, positive attitude, but with a little further investigation, I learned the inspiration for “RUDE” is taken for the Old Engiish, “ruddy” – like getting red cheeks after a healthy, brisk walk in the countryside. Long gone the days of boring brown packages, hello bold, bright and beautiful foods we eat for energy and joy. 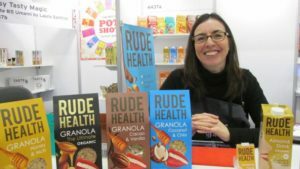 Health food with attitude-currently still in the U.K. – I plan to visit their cafe in London this spring and hope they make the journey here to the states soon. Click here for a video of our chat with them at the show. See you at Natural Products Expo West Anaheim 3/9-3/11! Please contact us at michelle@joyfulplate to chat more. We’d love to spark some strategic insights and creativity into your business plans for 2017!